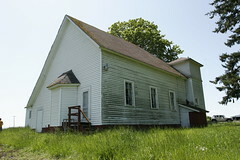 This old grange hall was one of the locations we initially considered for A Country Wedding, and it's wide open sight lines reminds me of the churches in the trailer for the Icelandic film "Country Wedding"
Just noticed the site for this film, a product of Iceland called Country Wedding. Watching the trailer, I thought it not only looks amazing, but it has some resonance with our film. The isolated church in an open field is the spitting image of what I had in mind when we were scouting locations. We ended up shooting a church in town, an amazing location, but when I saw the location in this trailer I had to do a double-take. That’s exactly what I was seeing in my head. I’m going to try to catch the Icelandic feature because it looks fantastic. And I’ll also ship them a copy of our film as soon as it’s available. The Icelandic movie “Country Wedding” was by far THE WORST piece of filming I have ever encountered. I honestly cannot find a single pro to this complete and utter piece of crap! I cannot find the articulation necessary to express the intensity of my displeasure in having viewed this. Hi Ted, I’ll reserve judgment until it shows up on Netflix. What didn’t you like about it? Was it they style or the story? What kind of films have you found stirring lately? Do you usually like indie films, or foreign flicks? Just curious. Thanks for posting.